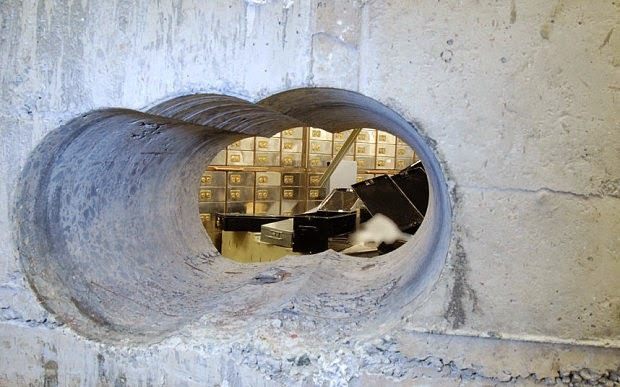 When I read that the burglars at the Hatton Garden vault robbery had gone through a concrete wall, I imagined men with sledgehammers. This photo of the crime scene is mind-boggling. That's 20 inches of concrete. More photos, and a schematic diagram of the caper, at The Telegraph. This reminds me of the Belgian series "Salamander." It's available on Netflix, and it's one of the most interesting series I've ever seen. English subtitles are available, and make the show quite approachable. Those holes are only maybe 150mm each, how skinny was the burglar ? …and there is no reinforcing in the concrete ! Call that a vault ??? I don't know where you came up with your number. I searched Hatton+hole+diameter today and found this: "The hole was measured at 25cm high and 45cm wide and was made using a Hilti DD350 model, the police said on Wednesday"
hilti makes some great tools! p.s. if the numbers are correct, that hole is approx. 9 3/4 H x 17 3/4 W inches. That IS interesting (and well-written). Tx, Aleksejs.